Female patient, age 53, presented with complaints of facial, temporal, neck and occipital pain after four previous attempts to rehabilitate her mouth. She was very unhappy with her long and big teeth (restored). Three previous comprehensive rehabilitations were done to her upper and lower teeth, but failed and a forth attempt to rehabilitate the full mouth following neuromuscular protocols were implemented by last dentist. The patient felt that her concerns were not being met even though the dentist said the K7 data was looking “normal” according to his interpretation. Patient brought these sets of model casts to Dr. Chan hoping improvements could be made and return the size of her teeth to what she had previously. A comprehensive examination was accomplished which included: Medical/dental history, extra and intra oral photos, postural analysis, ICAT imaging, musculoskeletal occlusal evaluation, craniomandibular screening, impressions, modified Fox Plane recording along with a complete K7 kineseographic jaw tracking, electromyographic and electrosonography joint analysis. 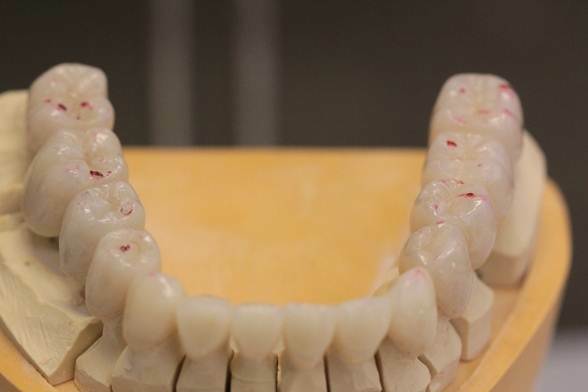 Models were mounted on a semi adjustable wax up based on objective recordings of a physiologic mandibular to maxillary determined bite recording. Joints indicated evidence of late opening clicks and early recipricol high frequency low amplitude signature sound patterns of both left and right TM joints (indicative of joint degenerations mainly on the right TM joint). Finding a proper mandibular position both antero-posteriorly and vertically has challenged some of the NM clinicians understanding. 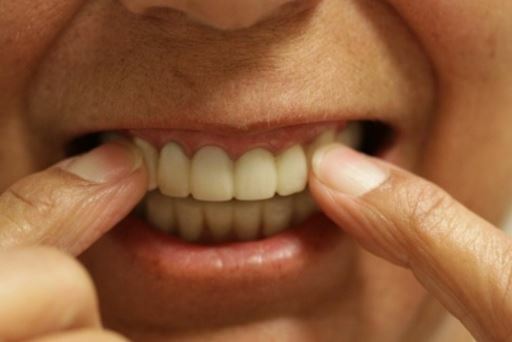 Patient has previously been evaluated with NM K7 technology reporting that the previous NM dentist indicated that her bite and data was normal and OK…and nothing was wrong. But patient could feel something was off. This new K7 data now objectively clarifies what the patient was feeling. Even though the classical myo-trajectory appears to be close, the GNM understanding realizes close is not good enough for some micron aware patients. This is the reason measurements are made and K7 data must be interpreted correctly. A series of sequential steps were required to first stabilize the patients occlusal position and calm the spastic tender and pain muscles first. Establishing a physiologic lower to upper jaw relationship was key. Using TENS and jaw tracking (K7, Myotronics, Kent, WA) following OC’s optimizing bite protocols was used. A diagnostic full mouth waxed up was created and designed to the corrected physiologic position (Scan 4/5), based on patients requests of recreating the size of her existing teeth back to their original size and shape prior to these last 4 rehabilitations. 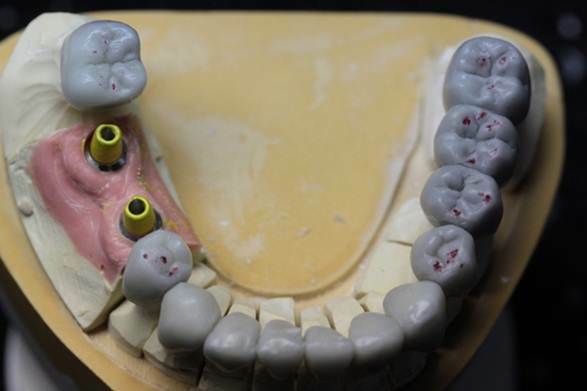 Once the neuromuscular system was calm and stable new upper and lower model casts were mounted and a full mouth diagnostic wax up was then designed and created as template with the new occlusal scheme based on the proven and stable relationship. New maxillary and mandibular fixed orthotics were bonded over the existing restorations as an interim stage to assess functional jaw positioning, muscle comfort and esthetics. I reshaped and reduced the bulky porcelain restorations contoured in order to cover and temporarily bond new shaped teeth over the upper and lower with provisional materials to re-establish proper occlusal and jaw position. Esthetics were redeveloped at this stage. No anesthetic was required during these steps. Patient was comfortable and very pleased with the initial results (removing the big bulky restorations gave patient emotional relieve knowing we were moving in the right direction)..
With this new bite and occlusion it allowed time for the straining muscles to calm down. Follow up visits were required to make necessary occlusal adjustments on the fixed provisional orthotic which help to further remove any small occlusal interferences that bothered the patient. 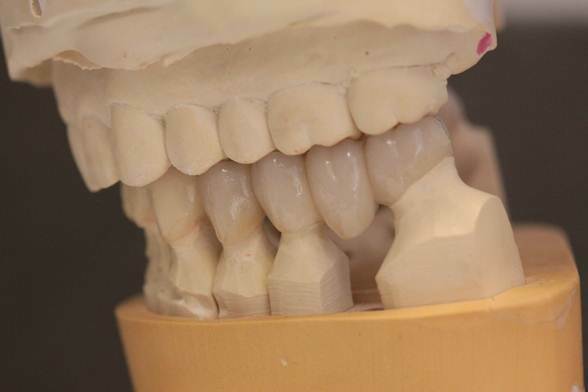 Once the patient was proven stable at this measured and calibrated maxillary to mandibular position the upper arch of porcelain crowns were removed along with the bonded overlaying fixed orthotic. The teeth were reshaped and a master impression was taken under local anesthesia. The maxillary cast was mounted to the Chan Maxillary Transfer Table via the modified Fox Plane technique. 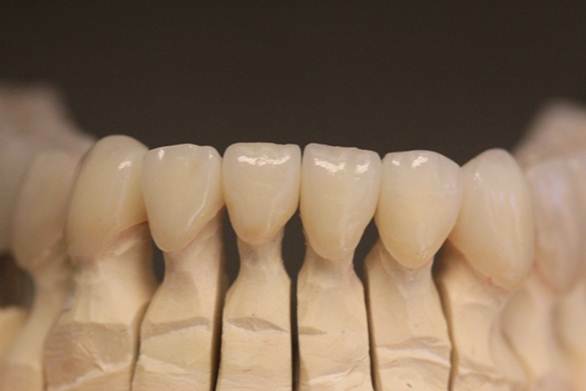 New porcelain restorations were fabricated to Dr. Chan’s prescription. A follow up visit was arranged to remove the provisional upper restorations and seat the new porcelain restorations to match the lower fixed orthotic occlusion (OC Level 6 Bite Management and Transfer protocols were followed). 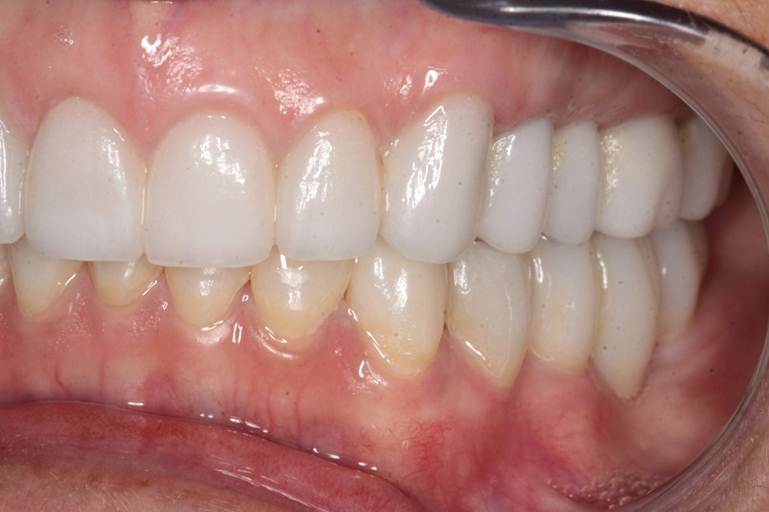 Following a 3 months period of stabilization the lower teeth were also prepared by removing the lower fixed orthotic with underlying porcelain restorations that were previously ground down and worn. The teeth were prepared and new restorations were seated. Below is the immediate occlusal contact marks immediately after cementation clean up. (The marks are prior to any occlusal adjustments). A follow up visit was arranged to TENS and refine the bite following (OC Levels 4 and Level 7 micro occlusal adjustment protocols). Jaw track of the chew cycle before treatment versus after optimized occlusion. Vertical dimensions were reduced to the patients physiologic vertical relationships following OC GNM protocols maintaining the objectively measured myo-trajectory (mandibular isotonic path of closure). No manual manipulation was used during this treatment. Muscles always seek to find a neutral homeostatic position. The GNM full mouth protocols support decompression of the TM joints and postural muscle health. K7 jaw tracking (computerized mandibular scanning) showing the open and closing trajectory is sychronized with the involuntary TENS trajectory. Prove that terminal contacts are correctly and physiologically positioned. This is one of the reasons why this patient feels better. Resting EMG recordings (left window) shows habitual rest position and also when patient brings her teeth lightly together, indicative of strained mandibular posture. Normalized EMG readings (right window) displays improved resting muscle activity and when teeth are lightly contacting in new optimized position the mandible is not straining (no torque). EMG muscle recruitment patterns were recorded with the patient clenching on her existing failing restoration/occlusion with and without cotton rolls as the control. Data (left window) indicates poor occlusal balance during muscle recruitment. Data (right window) indicates improved and balanced sustained muscle EMG patterns were observed after optimized occlusion has been established. Balanced EMG Timing of Occlusal Contact: Note the improved quiet zones before and after clenching to a physiologic optimized Bite. The CNS is now calm and happy. Patient comfortable and feels no occlusal interferences at a 10-20 micro level of detail. Patient reports have not pain of the neck, shoulders and any areas around the head and facial regions. Patient has been now free of any TMD pain and discomfort. Patient is comfortable and very pleased with results. She says she got her bite back!